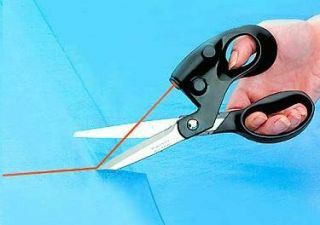 Laser Scissors - useless for shaky hands! We all have bottom drawers stacked full of useless gadgets from our past and a new survey today has compiled a list of Britain's 20 most useless gadgets. Electric nail files were found to be the most pointless household gadget of all time in the poll of 4,500 Brits, closely followed by Laser guided scissors, which claim to help you cut a perfect straight line. But don’t, because the laser merely shakes in line with your hand shaking. Electric or battery operated candles are the third most pointless item on the list. The survey was commissioned by reevoo.com, “the website which gives customers the opportunity to read reviews of thousands of products, written by real shoppers,” but hasn't answered our question as to whether it is 'teasmaid' or 'teasmade'.